my mom’s friend lori gave this recipe to my mom a few years ago. 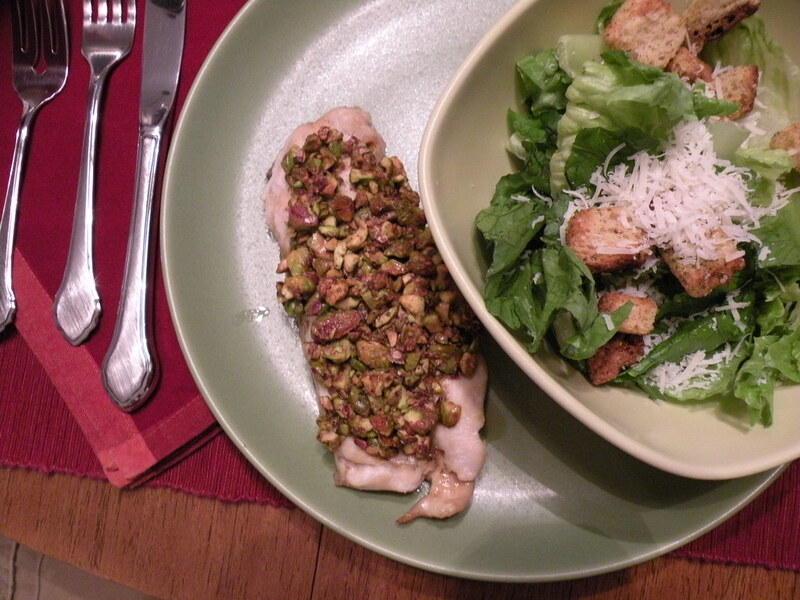 lori’s recipe is for pistachio fish. i do not like fish, but when my mom made this recipe using fish, i thought it made the fish taste bearable and had to try it with chicken. whether you like fish or chicken, you will not be disappointed. 6 6 0z. pieces of salmon or 3 boneless, skinless chicken breasts, halved. combine nuts, brown sugar, lemon juice, dill weed and pepper. set aside. place salmon in foil-lined 9×13 pan or chicken in a greased 9 x 13 pan. make sure that the chicken does not overlap or it will not cook evenly. the same goes for the fish, i suppose. spoon pistachio on top of the chicken. press down to form crust. bake the fish for 6-8 min, chicken for 25-30 min. Awwww you two are so adorable!!! Did you have it with the Pesto? Love you both!! Awwww!! You’re my friend, too! 🙂 Hope that you’re doing well.